5 Stars to Mickey Bars - Day #1 Dinner! Flying Fish. Yum. Wow - again. Apparently that's a reoccurring theme for me! WOW and YUM. Since we were splitting up for dinner tonight, we said our goodbyes to the Attic and strolled off for the super short walk over to Flying Fish. Our wonderful group consisted of A.j. (THE @disneyfoodblog), Jenny from Playground Magazine (@playmag), Maria Bailey (@momtalkradio), Laura Spencer (THE Disney Moms ring-leader and social media guru - @lauraspencerone), Kelby (@typeamom), Amy (@resourcefulmom)... and me (go figure!). I was a pretty lucky lady with these dinner companions! And, being foodies, we couldn't wait to start our meal with some great appetizers - salads, cheese plates, lobster salad, kalamari, crab cake... you name it - we got it! After appetizers it was time to order dinner! And what an ordering adventure it was - we were the DIFFICULT table - a vegan with a nut allergy, a vegetarian, a chick pea allergy (yup, you know who you are! ), and a couple of seafood non-lovers! As always, a Disney chef came to visit in order to ensure we were all happy! (Caution: bad iphone picture to come!) Look - he's even still smiling at us! Amazing! I wouldn't have been smiling!! As usual, I put my trust in the Disney Chefs - just requesting whatever veggie meal they could come up with... And, as always, I wasn't disappointed! The Pea Risotto in my Flying Fish-stlye Bento Box was incredible - I even made A.j. take a taste!! Could I fit more in? Of course I could - it was research! 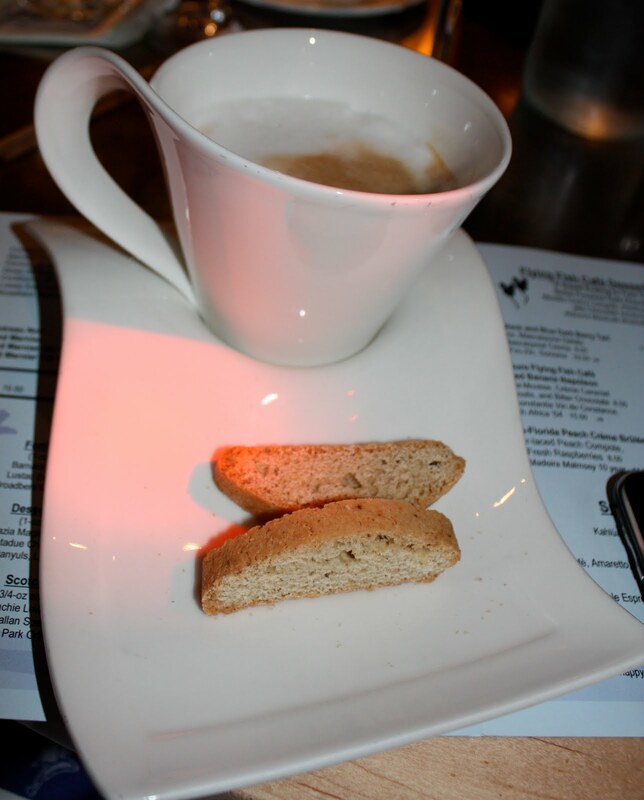 So, after a brief interlude of a Latte and incredible mini-biscotti (I'll take that recipe, PLEASE!! )...it was dessert time! And, Disney nuts, there was no hint of Nescafe in this cup! Woot! The Berry Cobbler was a popular choice, as well as the house sorbets (for the Vegan!). But, my love is chocolate - so I went with the Flourless Chocolate Torte. MMMM. 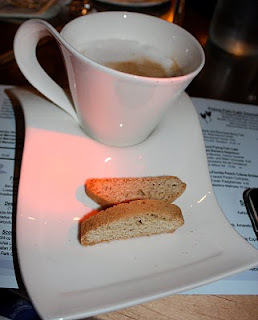 And, its accompanying Riesling cube was something we all just had to try - me, A.j. and Jenny. It was too unique not to try it out (its the clear cube). The manager also came over and treated us to a glass of incredible Moscato. YUMMMM. 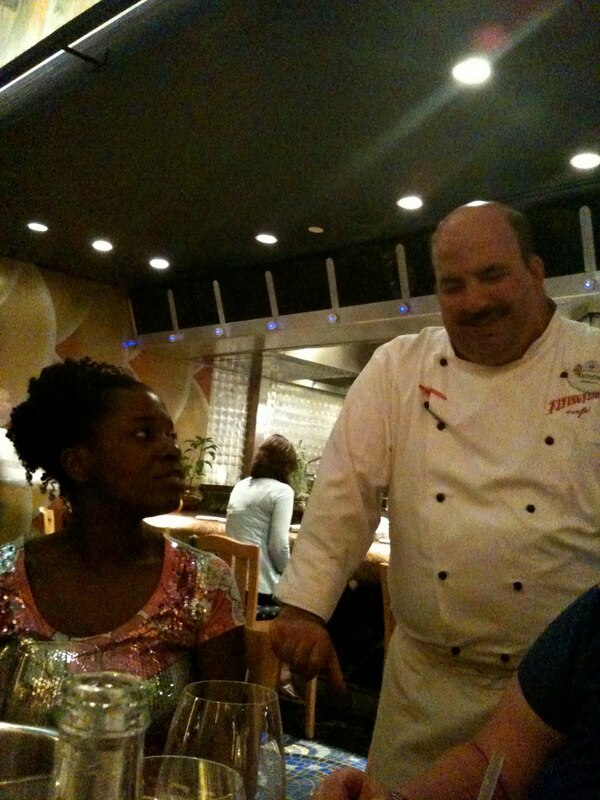 At this point, Chef Tim came over to check on us. I had to point out that I had a Hidden Mickey in my cookie! Now that's Disney Service. Chef Tim was even sweet enough to show A.j. and I the Flying Fish Hidden Mickey! Of course, he also told us of a mystery Hidden Mickey in the sweet shop sign right next door - he's stared at it for hours and can't find it! If you manage to find it - stop by and tell him! A.j. 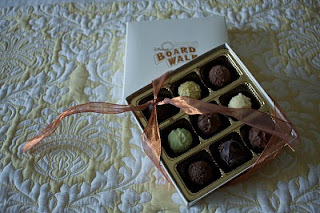 and I tried unsuccessfully and Boardwalk rumor is that it may not exist any more! Sadly, at 10:30 pm, our 3.5 hour dinner was over. Boy, did we like to talk and eat! 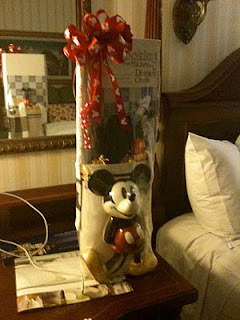 To walk off the calories (and since were were in DISNEY), A.j. and I decided to hit Extra Magic Hours at Epcot. We did a full loop of the park (calories burned!) and hit Spaceship Earth & Living with the Land before calling it a night at 12:30am!. Thinking I'd just drop off into bed - I was wrong! Waiting for me in my room where a few surprises I just had to check out! 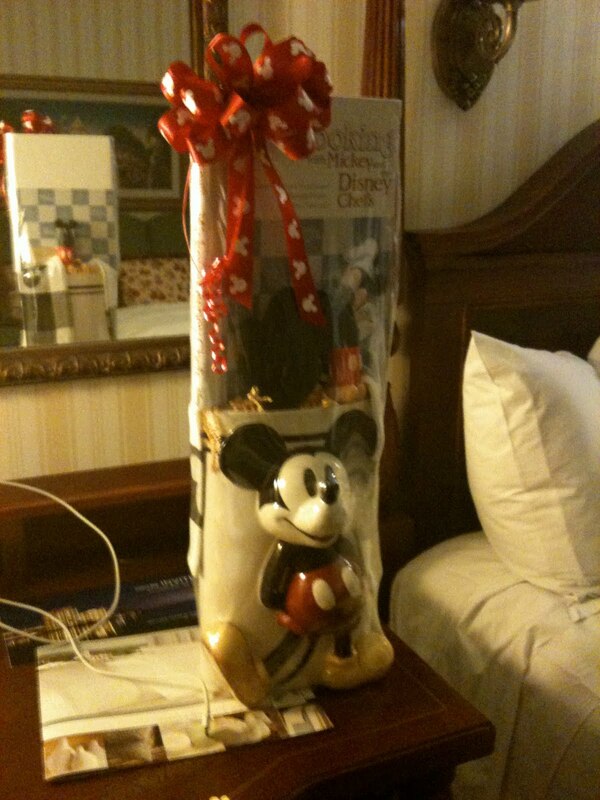 A Mickey chef's basket with utensils and a cookbook! Fruit basket, cheese plate (in the fridge - which I figured out the NEXT day :) ) and wine! In accordance with FTC guidelines, please note that my transportation, lodging, and food have been provided by the Walt Disney Company for this Media event. Is the Mickey above the scrolly parts? It's a stretch because it's not actually 3 circles, but does look like ears and the top of a head. ANYway...it looks amazing!! Thanks for sharing everything with us. I've never been to Flying Fish but will have to put it on our list now. Glad you were able to experience such a fun event! Thanks for following along - more to come! I promise to finish this report.. even though my past history on that isn't too good! Wow. I never even thought about this place before but now I'm going to try it on my trip in October! Thanks for the review. Pagash! or is it Pogosh? or... Pogash? or.... ok, it tastes good anyways! 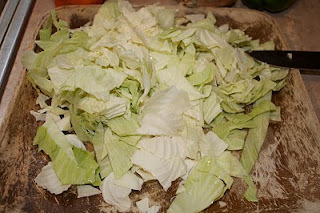 Seeing that great head of green cabbage in last week's CSA delivery, I knew just what I wanted to do! Pagash! Ok, I really don't know how to spell it... Google suggests that's the best spelling, so I'm going with it. But, it doesn't really matter how badly I misspell it. Its the taste that counts! Pagash is incredibly simple, and something that comes from my Slovak roots. Its a dish that my Italian-Hungarian mom has made for years for my Slovak dad. No one can top her perfection of it. A golden brown bread, stuffed inside with sauteed cabbage or onions OR, as my kids prefer, a cheddar cheesy mashed potato. Yup, don't make fun of it until you try it! The steps really are simple - and since I was pressed for time I made it even simpler: frozen bread dough. The first order of business is to chop the head of cabbage along with an onion and toss it into the frying pan with a little butter (substitute in our house) and olive oil. Add some salt and pepper. Saute away! So, I told you the basic Peanut Butter Cookie recipe was versatile. Didn't believe me did you? But it is! 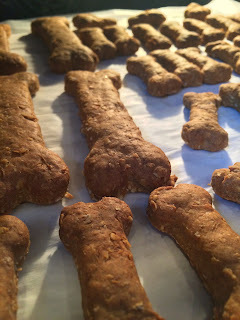 See, with just a quick adaptation you can make them into Peanut Butter and Banana treat that your doggie will love! Mix it up. Roll out (add a little flour if it sticks). Cut out with your doggie bone cutters. Same baking as the cookies: Bake for 45 minutes. Then turn off oven and let sit for a few hours (or move to a dehydrator). If cookies still seem soft after an hour or two, go ahead and turn the oven back on to 350 bake for 10 minutes, then shut off. Don't open the oven and let them cool. Looking for something fun and different to do this weekend? Don't want to leave your dog behind? Then check out this great event put on by the Greenville Road Warriors: Pucks & Paws. (Scroll down to March 30- it is kind of hidden). YOU get to enjoy a great, local sporting event. YOUR doggie gets to enjoy it with you! Sounds great to me. You can even sit with dog friendly folks with Rocky Creek Veterinary Hospital. They have an event set up for Pucks and Paws on Facebook. Tickets can be reserved in advance by calling Zach with the Road Warriors at: 864-420-6307.